Note: All of these pictures were taken by Sherida at the church. Thanks Sherida! Father Michael Faulhaber donated the three-acre plot to the Church. 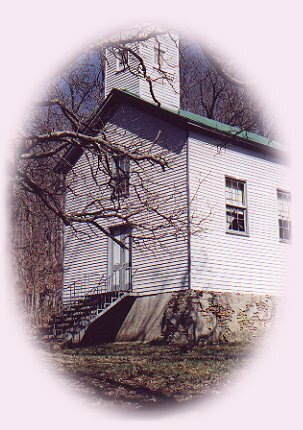 Originally, a one-room, log schoolhouse was located to the right of the Church. (Today, there are four gravesites where the school once stood.) 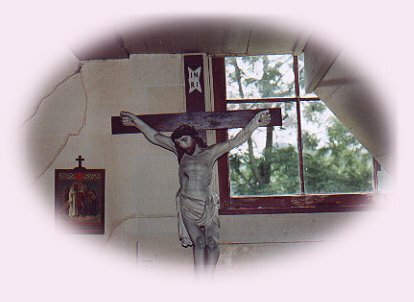 Many of the parishioner’s children attended the school that was, at one time, taught by Mrs. Mary Emminger. The Church is in good condition considering its age of 140 years but is only open on special occasions. 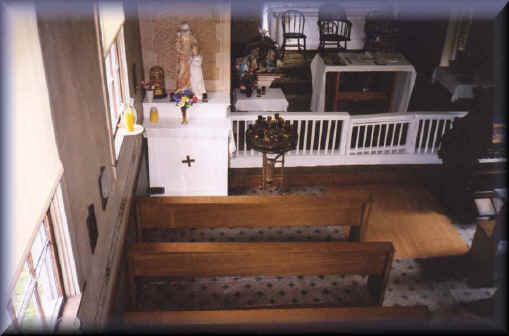 The expert craftsmanship of the German immigrants is evident, especially in the hand-hewn pews. 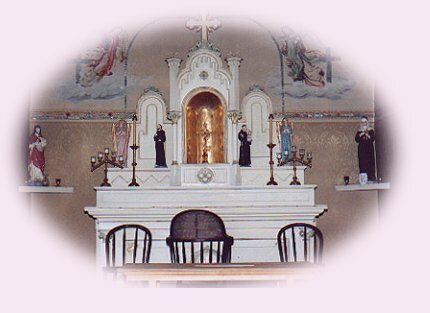 In preparation for a family wedding, the brothers of Father DeJacco added the artwork and details painted on the walls in 1937. 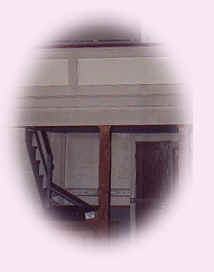 The backs of the chairs on the altar are hand-caned. 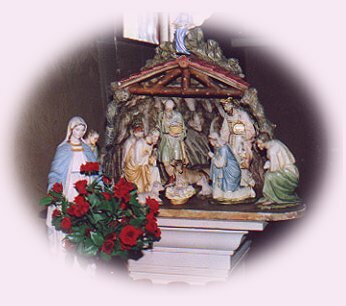 The Nativity to the left of the altar was later imported from Germany. 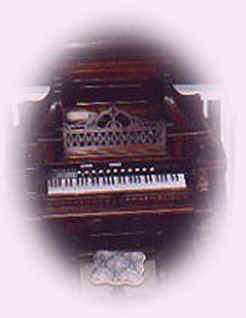 The ornate organ, to the right of the altar, was manufactured in Vermont and at one time was located in the balcony. Its tiny stool is original to the piece. 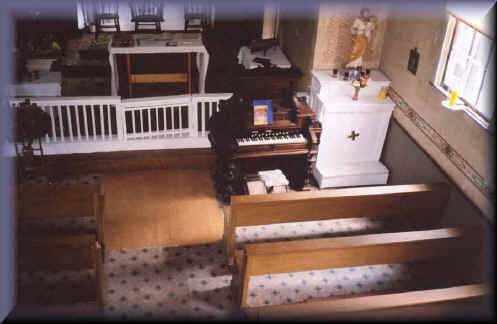 An old piano and four pews are in the balcony as is the bell rope. The Cemetery is located on the hill behind the Church. Many of the original parishioners are buried there. Although some of the early graves lie unmarked today, surnames of families buried there include Emminger, Dittelburger, Steimer, Faulhaber, Laux, Radenheimer, Eschmann, Nordheim, Fleckenstein, Borgerding, Reuk, Rust, Cook, and Schmitt. Like the Church, the Cemetery is well maintained by a local family and pink Magic Lilies, planted many years ago, dot the hillside. Burials there are now limited. The last time a grave was dug, it was necessary to use dynamite due to the massive rocks below the surface. Directions: From the AA Highway, turn onto Route 154 towards Peach Grove. The road to the Church is the first right on Route 154. The road is not marked but the Church is less than one mile after the turn. From Route 27 or Route 10, turn onto Route 154 and follow until almost to the AA Highway. Turn left at the last road to the left. The road is not marked but the Church is less than one mile after the turn.